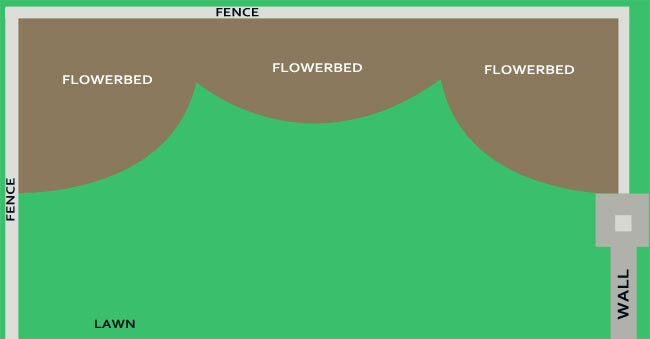 Need to incorporate a curved flowerbed in the corner of the lawn. I am wondering how I can extend from this bed to the other corner and make it look good. I have provided sketches of some options. I would love some advice as to what would look the best. Hello and welcome aboard. More info needed before the true gardeners can advise you (I am not in that group!). Which way is north? 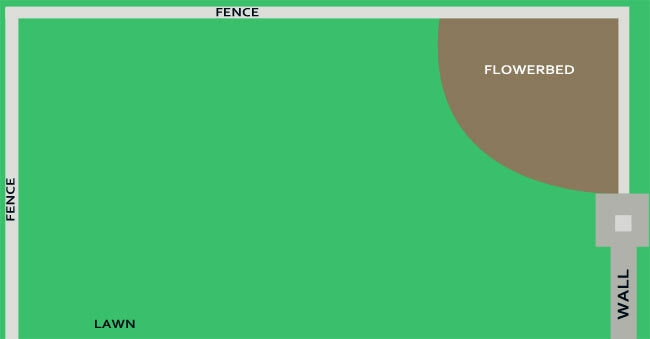 What height are the fences? Which parts of the garden are in shadow due to trees or buildings etc.? Soil type? Coastal or inland? Dimensions? A picture (photo) paints a thousand words. And just out of interest what programme does that sketch/drawing? 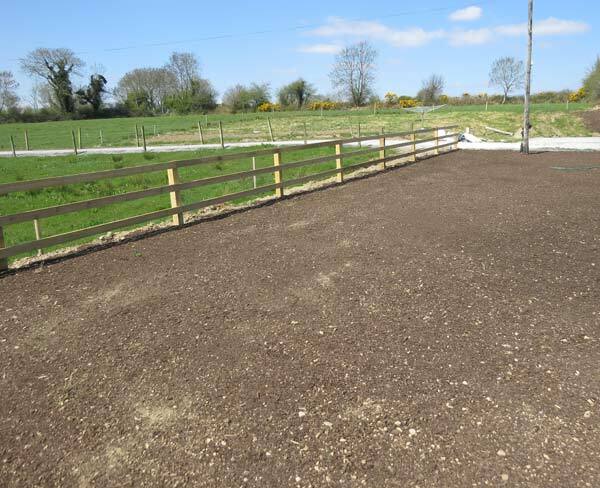 You should read through a thread entitled 'Planning a perrenial garden' in the 'Garden planning, prep and landscape design in Ireland' section. It is a good read and I have to say congratulations to Nozebleed as he kept us informed all the way through with his project and we could all share his enthusiasm through all the stages as he didn't just come on board for the quick advice and disappear forever as many others have done. It is nice for the regulars to see how the work comes along and a garden created after putting in the time to help out. Hi, thanks. Tomorrow I will add a picture. The fence is around three foot. There seems to be full sun on the lawn as there are no high trees blocking the sun on the South side. Only shadow seems to be from the stakes of the fence. 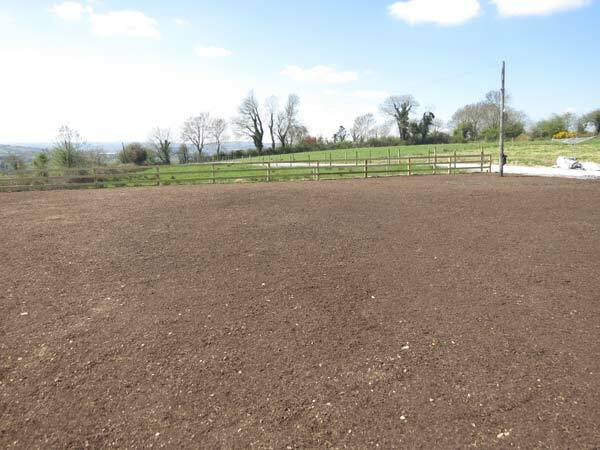 The soil is decent enough shape as it was prepared for a lawn and then a few feet down there is clay soil. Tomorrow I will get proper dimensions. By the way, I just drew the sketch (pen tool and rectangle shapes) in Photoshop CS5. Hello, Spiracles. It is good to see a new member looking for a hand. 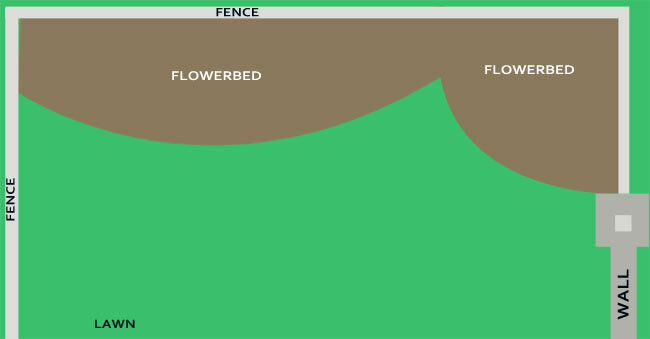 One thing to bear in mind when designing a lawn/bed combination is the need for maintenance. Be sure that the edge of the lawn is easy to follow with a mower - that it doesn't require awkward stops and starts or tricky manoeuvres. 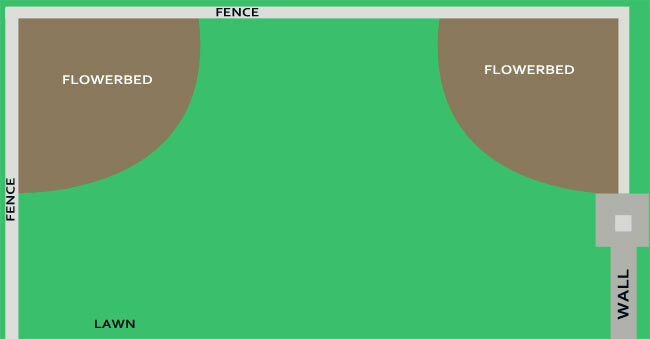 It is useful, at the planning stage, to think about what happens where the lawn meets the wall or fence, too. Good planning now can save a lot of fiddly work later. May reconsider extending bed to opposite corner as the distance is quite large. That's a big piece of garden! And although it looks very exposed and laks shelter, there is a great view. Now that we have a better idea of scale and location (I, for one, assumed a smaller suburban plot, from your sketches) we are in a better position to offer useful information. Where does the wind blow from? Where do you want to include a distant view? Where do you need to ensure privacy? Where are your points of access to the site as a whole and to the house, outbuildings? What dedicated spaces are needed - play, storage, parking, utilities. Having established answers to these questions I'd start sketching out various alternatives, but freehand. I find using a computer early on can inhibit idea generation as you will tend to go for what is easy to do on a computer, rather than for a fresh idea. I think shelter from wind will be an early priority in that garden. I thought it was a small suburban plot too, just goes to show huh? Whole new ball game now. Thanks, those are some good questions to consider. The wind mainly seems to be strongest coming in from the west. Privacy is not a concern and point of access is further east from the area shown in the picture. Those photos change the whole scenario. I had thought it was a small suburban space too. 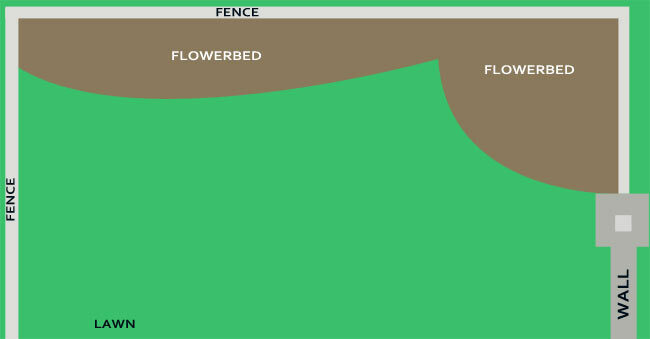 I wouldn't be thinking of just flower beds in that situation now. My mind would be running rampart with other ideas. What size is it? i.e. how many strides one way and how many strides the other? Have you considered other things besides grass and flower beds? You've done a good job on harrowing it by the way. I think your directions might be out and contradictory. In your second sketch in your first post I think the ESB/tel pole is in the flower bed quadrant. This would then make the orange arrow in your second post pointing north and taken from the south direction. In your photos, the first says looking from east but is of course looking in a westerly direction. Similarly, the one labelled south is looking north, and the converse for the third photo. It all works for the shadows anyway. Can you give us some clues as to your personal preferences as you must have some. Trees and what size maximum, maybe hedging, a rockery feature, is the soil to stay level or do you want it raised in places, shrubs, all flowers, favourite colours, all year round interest or seasonal. Answers to these will help to narrow down the choices. In your second sketch in your first post I think the ESB/tel pole is in the flower bed quadrant. This would then make the orange arrow in your second post pointing north and taken from the south direction. You're right, I seem to have made a right mess of it. The orange arrow in my second post is coming from the south and pointing North. The first says looking from east but is of course looking in a westerly direction. The one labelled south is looking north, and the converse for the third photo. It all works for the shadows anyway. Again, this is true, I will adjust now. Unfortunately cannot plant trees as there is a nice view plus some trees had to come down due to interferences with signals and the like. Ideally, would like some small to medium sized shrubs/hedging no taller than the fence, as well as a mixture of flowers providing all year round interest. Personally love Forsythia and Burning Bush, as well as things like Creeping Thyme, Rhododendrons. You've done a good job on harrowing it by the way. As for the basic design, I'd go for option B, but modified. 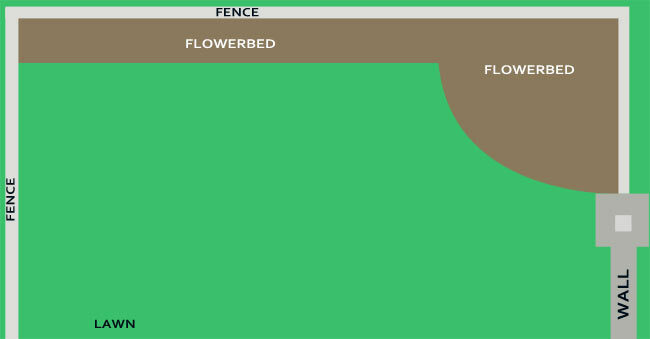 Basically bottom half lawn, top half beds. instead of sharp scallops, difficult to mow, I'd go for a long shallow arc, and create paths to demarcate beds, and so you can access the beds easily. I'll say it again: freehand sketching, more or less to scale, is the way to go when generating ideas. 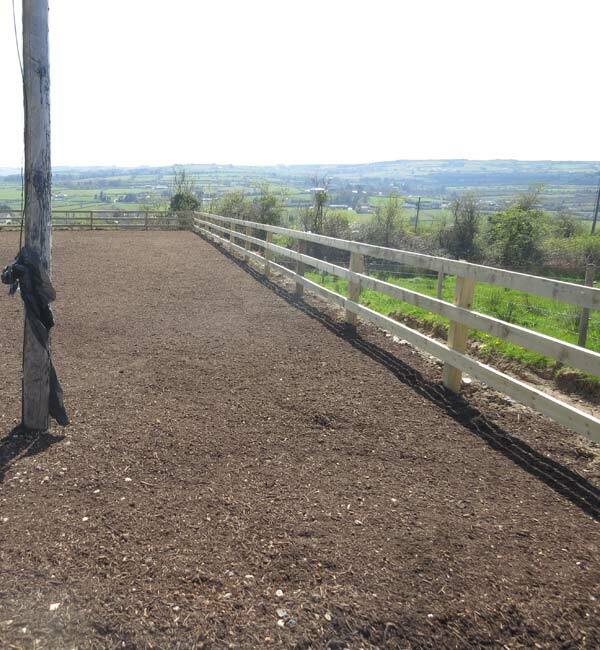 It is more flexible than CAD and more amenable to changes made 'on the hoof'. CAD is then great for producing final drawings, where the precision is very useful and where iterations can can be readily developed. But first you need to work out the general ideas. Another idea which Good Guy just prompted out of me. Get a bag of sand or lime and sketch on the ground with that until you feel comfortable with what you see and like the shape. 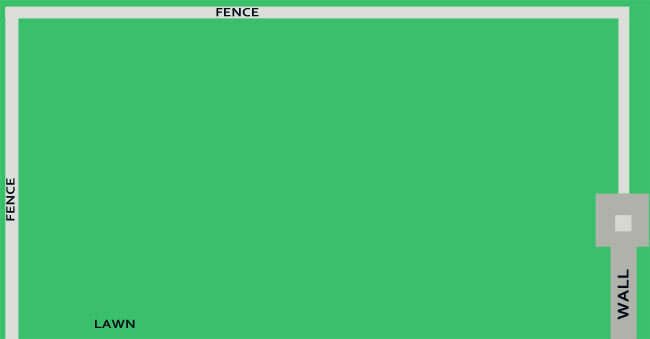 Mark out paths, washing line, compost bin, play areas etc.etc.